Cheryl Bazzoui reviews "Roads" by Marina Antropow Cramer. Marina Antropow Cramer’s debut novel, “Roads,” centers on a family living happily in the beautiful coastal city of Yalta, Crimea, in the early 1940s. But with the arrival of WWII, things quickly take a turn for the worst. Unforgettable characters and a plot that takes many twists left my stomach in knots as I tried to imagine how anyone survived at all. When the novel begins, life is relatively easy for 16-year-old Galina; her father, Ilya; and her mother, Ksenia. But before long, the Nazis arrive. At first the occupation’s only effect on their idyllic life by the sea is a shortage of basic supplies. They and the other Yalta citizens adjust to these changes as best they can. But then a few people start disappearing, followed by whole families. Finally, public hangings of neighbors and friends who are deemed Nazi traitors begin. 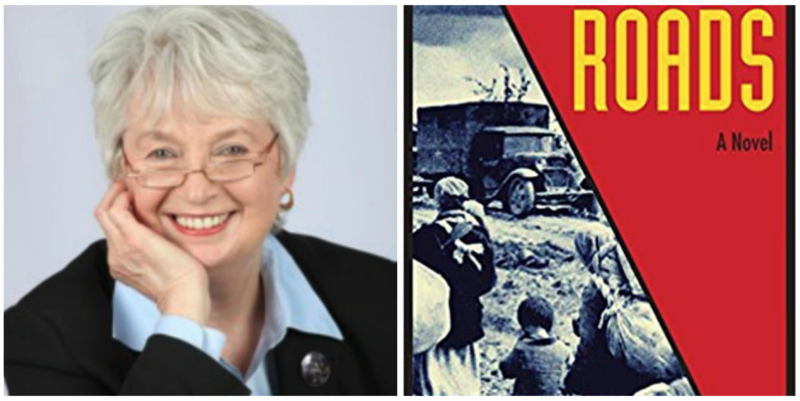 Through Galina and her family, Cramer portrays the depth of the Russian civilians’ suffering during WWII with empathy and skill. Galina offers to marry her 17-year-old childhood friend, Filip, to save him from being sent to a German work camp—or worse. Galina’s parents share a rare devotion to each other and their family, and this is the kind of love Galina hopes for when she hastily marries Filip. The author’s skill at threading themes through the story and creating multi-layered characters is spellbinding. Galina and her parents’ hope and determination to survive are inspiring. In desperation, Galina, Filip and her parents volunteer to go to Germany to work in the factories and farms. This choice makes sense to them at the time, but as the story continues each decision proves worse than the one before. When they finally decide to go to Dresden to find somewhere safer, I wanted to tell them, “No, no, anywhere but Dresden!” But, of course, I couldn’t change the outcome of the story. In Dresden, the men and women are soon sent to separate camps, and survival becomes a daily struggle. Self-centered Filip continues to work the least and gain the most from his minimal efforts. When the war finally ends, Galina and Ksenia use the fragmented organization of the church, as well as refugee networks, to eventually find Ilya and Filip. By then Galina has lost her naivety, and realizes she will never have the kind of love with Filip that her parents share. She has learned firsthand the true meanings of fidelity, trust, grief and family. I have read many WWII novels over the years, but this one explored the war from a totally different angle. The author was born in postwar Germany to Russian refugees. She said the origins of this book came from growing up among Russian expatriates and listening to their stories, though she was totally unaware that someday she might creatively combine those stories into a novel. Readers of “Roads” will be forever grateful that she did. She does a great service to her Russian ancestry, shedding a far different light on everyday Russians than the news media does on daily basis. Reviewer Cheryl Bazzoui is a retired registered nurse and an author from Bradford. She writes under the pen name Ann McCauley. I first read "Where the Red Fern Grows" 36 years ago. It’s a coming of age novel about a young pioneer boy of strong character. I remember the night well. I was telling my then 13-year-old son good night when he told me about the great book he was reading for school, and then mentioned the book report was due the next day. I asked, “Have you finished reading the book?” He shook his head with a worried expression. “Well, how far are you?” He showed me—page 69. One-hundred and eighty pages to go, and it was already 9 o’clock on a school night. The novel “Maureen” is named after its main character. The disenchanted city girl answers an ad in the Seattle Times, and two weeks later moves to Eastern Washington to work as a nanny, housekeeper and cook on a large cattle ranch. With no experience, only great instincts and resilience, she flourishes on the ranch. Maureen’s two sisters and brother are shocked at her decision to leave the city, but she proves that you can take a girl out of the city and transform her into a country girl. It's almost too obvious to be worth pointing out, but healthcare impacts everyone. And it seems like there's one thing everyone can agree on. Healthcare is expensive, whether we're talking about drug prices or insurance premiums. It wasn't always like this. The story of how healthcare got this way is the subject of Elisabeth Rosenthal's book “An American Sickness: How Healthcare Became Big Business and How You Can Take it Back.” I'm always interested in current events, and with the battles over healthcare on the national stage, this book seemed particularly timely.